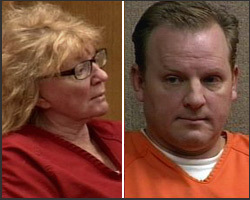 San Luis Obispo Superior Court Judge Jac Crawford sentenced Estate Financial, Inc. principal Karen Guth to 12 years in prison and Joshua Yaguda to eight years for fraudulently selling securities without the proper licenses, lying to investors and stealing or destroying property worth $3.2 million. Guth and Yaguda pleaded guilty in October to 26 felony counts after Crawford offered a plea agreement that stipulated that the defendants plead guilty and agree not to appeal in exchange for the eight and 12 year sentences. Yaguda, 49, could be released after serving another three years in state prison. Guth, 65, considered to be the primary owner and operator of the failed investment firm, faces an additional five years of incarceration if conditionally released early. Victims of the financial schemes asked the judge to render a stiffer penalty. Guth and Yaguda sat quietly while 28 investors related how the defendants’ crimes had impacted their lives. Many had lost their homes and had been forced, though well into retirement, to look for employment in order to make ends meet. A few broke down and wept while they explained how the crimes of Guth and Yaguda had left them broken, depressed and hopeless. Guth’s attorney, Steven Smith, said that Guth had not lived the lavish lifestyle she was accused of enjoying at the expense of investors. He told the court how he had been given a ride in her broken and aged Jaguar and how her 4,000 square foot home was in disrepair. He failed to mention that aside from her home, she had owned vacation homes in Cayucos and Cambria. The Moonstone Beach getaway included white water ocean views from every room. Crawford elected to stick to his plea agreement. As a result of the sentencing, the pair’s assets, such as the Pasolivo olive ranch, can now be sold. Enticed by the promise of 12 percent interest on property-secured investments, approximately 3,400 investors entrusted their nest eggs with Guth and Yaguda. Estate Financial’s portfolio contained more than $317 million in monies owed to investors when the company filed bankruptcy in 2008. Of that, only $21,000 was held free and clear. A restitution hearing has been set for Feb. 24.